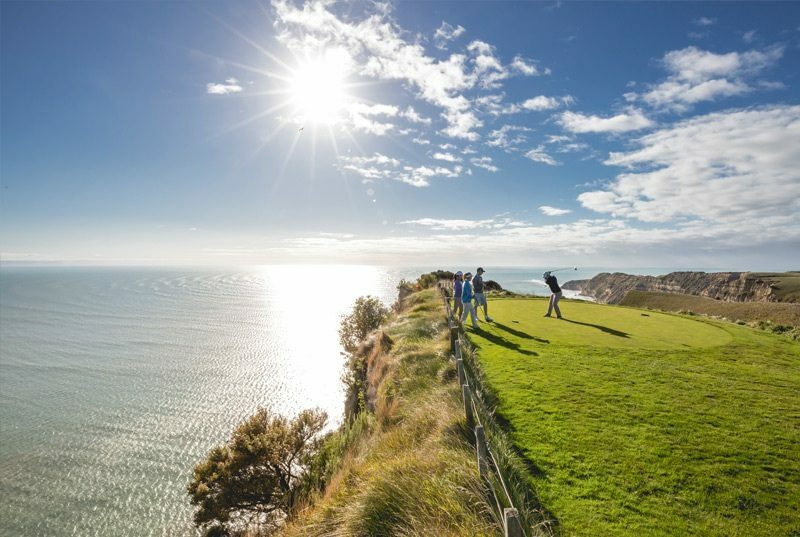 Funded with capital infused by an American billionaire, designed by one of the most sought after golf architects and located on a cliff-side location in Hawke's Bay, Cape Kidnappers has rightly earned honors as a top course in the world from every major golf publication possible. 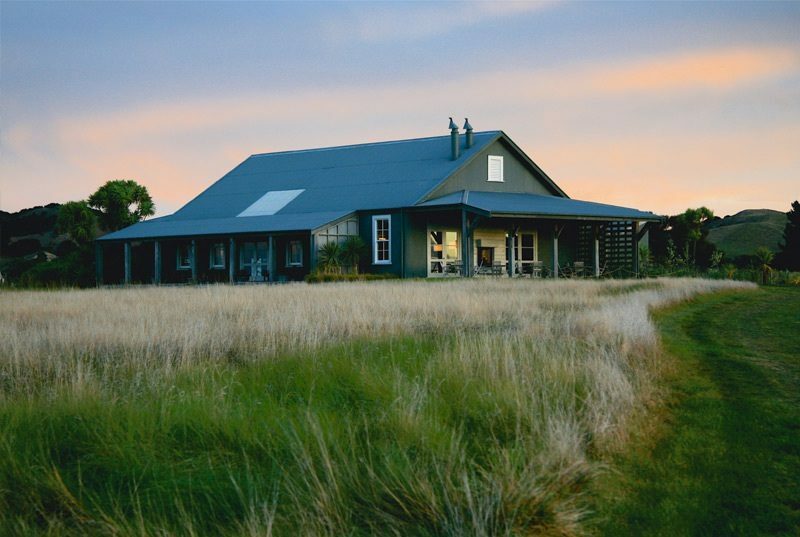 This former sheep station turned golf course follows a sense of minimalism, with as little earth moved as possible. The Cape is not true links terrain; instead the land tilts toward the sea as a series of ridges which jut outward toward the edge of the cliffs. The result is seaside golf at its finest. The surface is firm and fast, and the conditions can be windy so players who can control the trajectory will master the course. Shots will be played over treetops and cautiously along the edges of deep ravines. 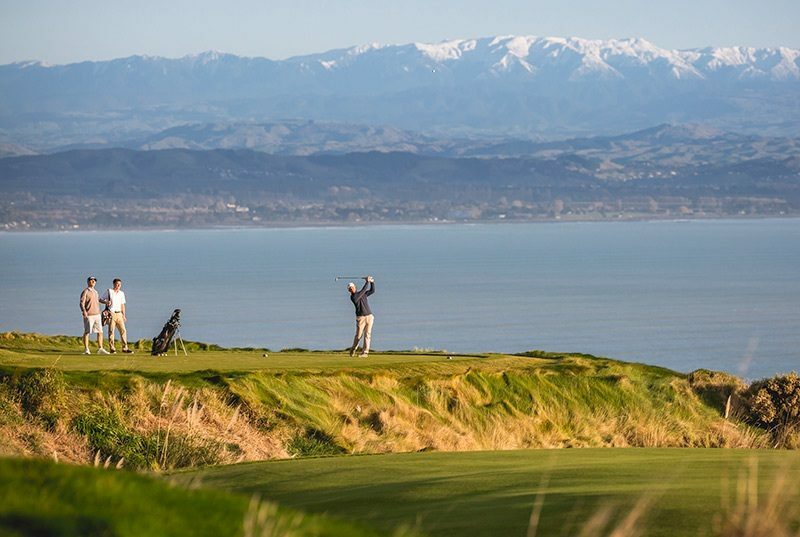 Every hole has a view of Hawke's Bay, and a favorite of some guests is to tee into the ocean and count the hang time (almost 10 seconds) to reach the ocean 500 feet below. 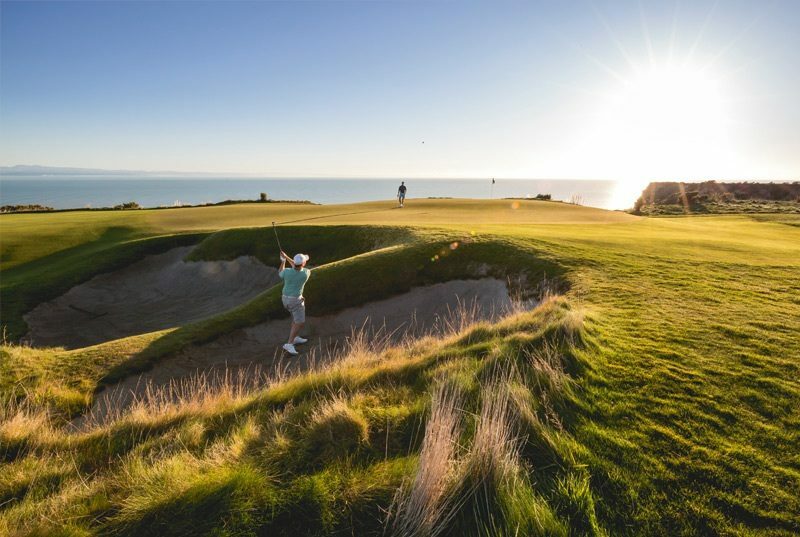 Players at Cape Kidnappers may attack the pin due to generous fairways but attention should paid to the wind in order to arrive at the most advantageous angles. 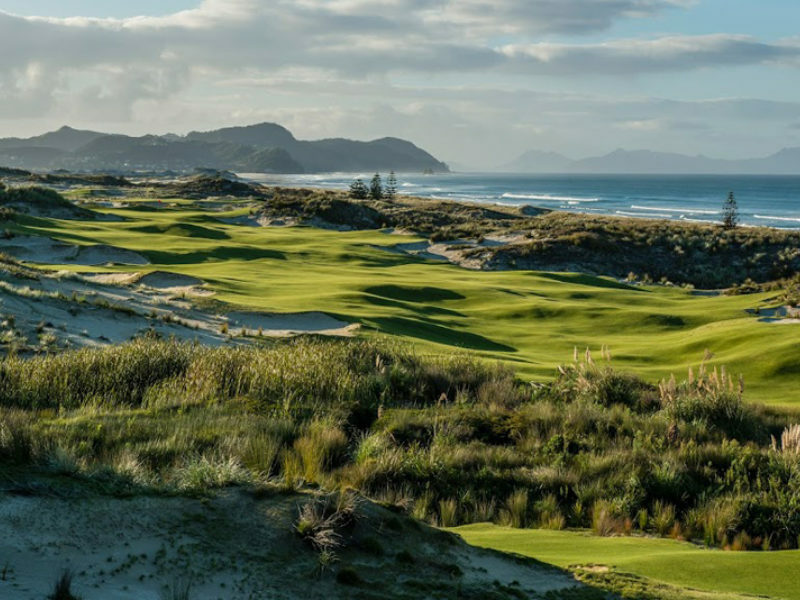 The magic of Tom Doak's design, and a characteristic of all good golf architecture, is the ability to make a course look harder than it plays. 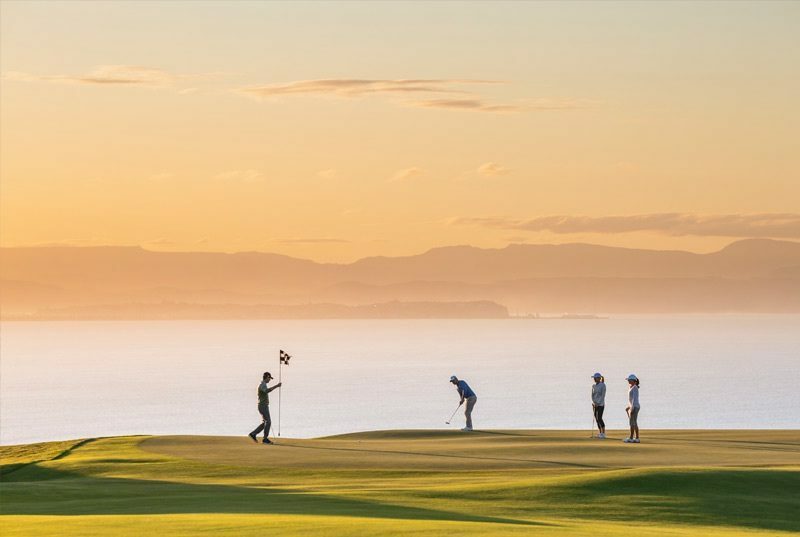 Suiting design to both the high handicapper while providing rewards for perfectly placed shots is what Cape Kidnappers is all about... in addition to the astounding views of course. Found in many Doak designs are bunkers to one side of the green or another. This provides a choice for the player: play to the safe side or go for the pin and risk the traps. For the high handicapper, the choice should be to play to the safe side. Directing the ball on to the green is the reward. For the mid-handicapper, the temptation will be to shoot closer to the pin but common sense dictates to play to the safe side as well. However, when lining the shot be sure to truly aim to the safe side and not look at the pin at the last second. 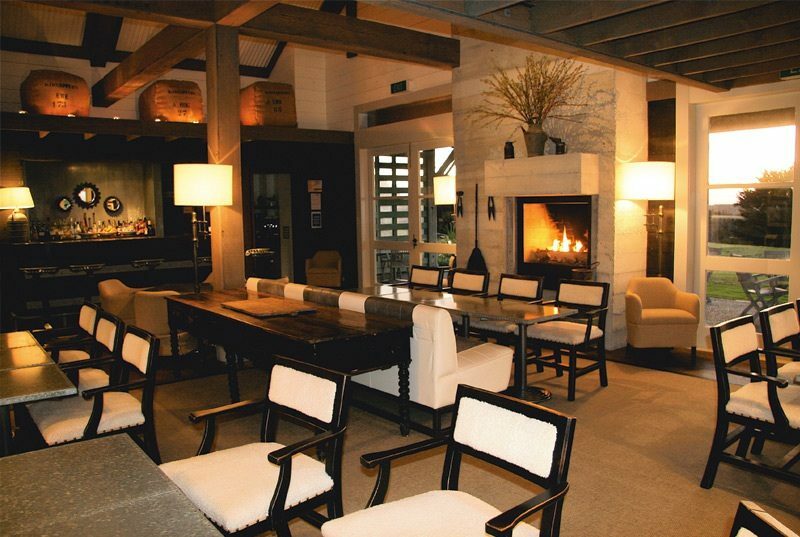 It's a visual trap used in golf architecture to test one's ego. For the low-handicapper the choice is simple: stick the shot to the pin and you are rewarded with a birdie attempt while the alternative is a much tougher up and down for par or potential bogey. 4th: The tee shot on this hole is scary- especially to those who play the course for the first time because it is blind. This is perhaps a hark back to historical British links design by Doak, and a characteristic often not employed in modern golf design. 6th: Par-3. Playing over a deep ravine to a broad fairway, this hole has pot bunkers up the left side, gullies, and is lined by rough grass. Hitting the ball into the grass will lose it and on most days a the strong north west wind can force balls into these hazards. Cutting the ball is a nice skill to have. 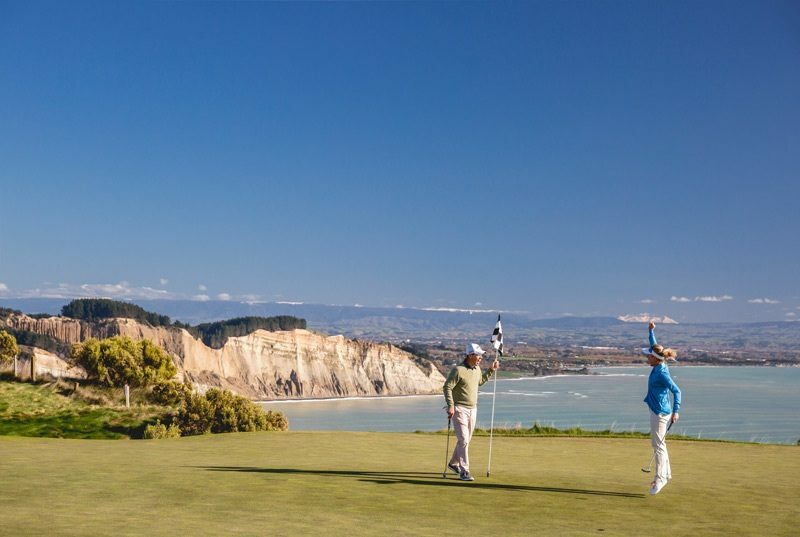 12th: A great hole to demonstrate the "signature" of Cape Kidnappers itself is the infinity green on the 12th. This approach shot is toward the water and visually looks as if an errant shot long will fall off of the back of the green and over the cliff. In reality the 13th green is beyond the green and it makes sense to hit with confidence rather than contend with the gentle slope off of the front side of the green. 13th: Par-3. Plays along the edge of the cliff side and players contend with 5 bunkers for a shot to a raised green, which looks like it disappears into the abyss off the far side. 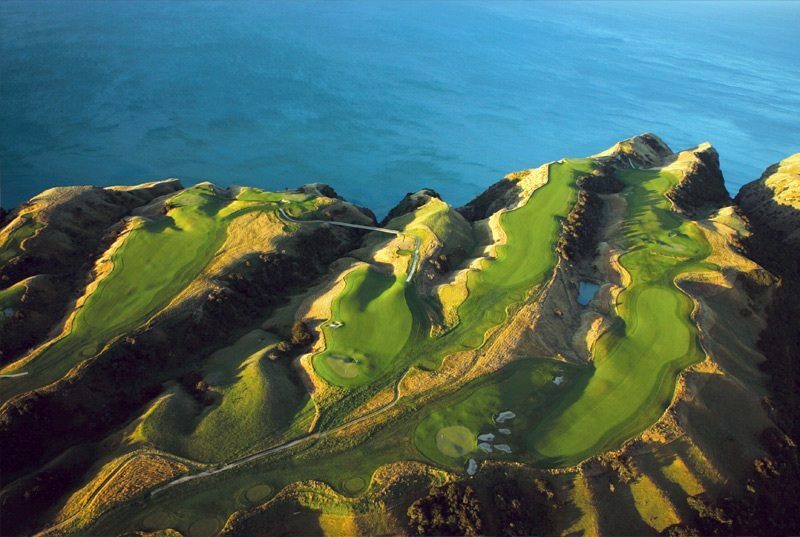 14th: Jon McCord, PGA Professional at Cape Kidnappers says, “14 is called pimple. It's a short Par 4 that, if the wind is out of the right direction, you can have a chance at knocking it up near the green. That is of course more easily said than done, as once you get close the green is its main defense. It has this very deep pot bunker in the front and this little pimple of sorts, hence its name, on the green. So you have a false front on the right with a green that is very tough." Tip for those without the distance on this hole to hit within 10 yards of the pin lay back and leave yourself a full shot to where you can create some spin. The green runs away a little bit even in its flatter sections. 15th: You would not be the first person to tee up as you look out over the cliff and blast a drive into the ocean... just to count the number of seconds it takes to reach the water.